alaTest has collected and analyzed 114 reviews of HTC EVO View. The average rating for this product is 4.3/5, compared to an average rating of 4.3/5 for other products in the same category for all reviews. People are impressed by the portability and size. The price and usability are also mentioned favorably. We analyzed user and expert ratings, product age and more factors. Compared to other products in the same category the HTC EVO View is awarded an overall alaScore™ of 85/100 = Very good quality. alaTest has collected and analyzed 29 user reviews of HTC EVO View from Amazon.com. The average user rating for this product is 4.4/5, compared to an average user rating of 4.1/5 for other products in the same category on Amazon.com. People really like the camera. The screen also gets good feedback. 90% of the reviews on Amazon.com give this product a positive rating. Fast 4G coverage. Sleek, classy design. Solid performance. Clear, bright screen. Excellent pen input. Sense UI improves on Gingerbread OS. HTC's extra apps are solid. Sprint's 4G coverage is still spotty. Outdated, non-tablet-specific version of Android. Google Talk video chat isn't supported in Gingerbread. Slow browser performance. Cluttered default layout. Cameras are only mediocre. 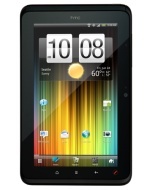 The HTC Evo View 4G puts a new spin on the 7-inch Android tablet, but its high price and smartphone-style OS are a tough sell next to its bigger, cheaper Honeycomb kin. The HTC EVO View 4G for Sprint adds a fast 4G connection to the HTC Flyer, an already capable tablet with excellent pen input options. But unless you really want the pen experience, Android tablets running Google's Honeycomb OS are a better choice. The HTC EVO View 4G gives you a fair return on your dollar, but ultimately falls behind in areas like battery life and screen performance.